Last summer, two researchers from the New England Complex Systems Institute published a short paper examining the correlation between rising food prices and civil unrest. It was a timely analysis, to say the least. A number of food riots were occurring throughout the world, not to mention waves of revolution sparked by the high cost of food. This is nothing new; throughout history whenever people have struggled to put food on the table for their families, social unrest has been a common consequence. The French Revolution is a classic example; after decades of unsustainable fiscal and monetary practices that wrecked the French economy, the harvest season and subsequent winter of 1788 were particularly harsh. People went hungry, and it ultimately started the revolution. The researchers’ analysis went a step further, though; they modeled the relationship between food prices and social unrest to reach a simple conclusion– whenever the UN Food and Agricultural Organization (FAO)’s global food price index climbs above 210, conditions ripen for social unrest. Today, the FAO’s food index is at 213… and rising. Netherlands-based Rabobank recently published its own analysis, forecasting further rises in food prices well into the 3rd quarter of 2013. 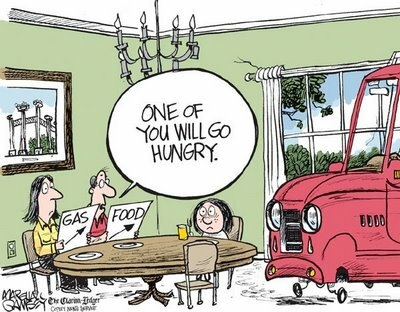 There are so many factors driving food prices higher. From a demand perspective, world population is growing at an extraordinary rate… plus the rise of billions of people from developing countries (especially in Asia) into the middle class is quickening demand for resource-intensive foods like beef. From a supply perspective, drought, soil erosion, and reduction of available farmland all put significant pressure on global agricultural output. And finally, from a monetary perspective, the enormous amount of paper currency being printed in the world is finding its way into agricultural commodities. I cannot envision a slowdown in any of these factors anytime soon. Central bankers will continue printing, people will continue procreating, developing countries will continue becoming wealthier, etc. So we should absolutely expect rising food prices for quite some time. Long-term, technology will ultimately solve these problems… but large-scale implementation is a long way off, and it may certainly be a bumpy ride ahead. Individuals can hedge their exposure in a number of different ways. The simple option is to invest in agricultural ETFs or long-term futures contracts. But I can hardly recommend this as a course of action given the massive systemic risk in the financial system. Just as we often recommend holding physical gold and silver rather than owning a gold ETF, it’s much better to own physical agricultural assets. If you’re on a budget, small gardens can be planted for a pittance as long as you’re willing to roll up your sleeves. Even if you live in an urban area surrounded by a sea of concrete, tabletop hydroponic and aquaponic systems can be set up on the cheap… and they’re easy to maintain. If you have more capital to deploy, consider buying agricultural property, preferably overseas. Buying foreign real estate is a great way to move money overseas, plus it gives you a place to go if you really need to escape. As I survey farmland prices around the world, the best region to buy is South America, particularly Chile, Paraguay, or Uruguay. I’ll have more detail on those locations in a future letter. Bottom line, if the analysis is correct and food prices continue to rise, agriculture will be one of the best investments of the decade. As Jim Rogers has said so many times before, it will be farmers driving Maseratis, not stock brokers. Plus, you will have secured yourself a steady, reliable supply of food. Even if the analysis is wrong and all the world’s food challenges are magically solved, it’s hard to imagine being worse off for having your own food supply… or owning beautiful, well-located land in a rapidly developing foreign country.